I've always said that New York is the best place on earth to experience the internet. The city is mapped online, and vice-versa. The city's life is extended online, and stuff on the internet shapes the phycial form of the city. I said that in 1998, in an article that ANY rejected. (They probably saved my writing career). I always knew I was right, but I didn't really feel vindicated until today. It is with great pleasure that we discovered, via the ever-vigilant Curbed, NewYorkology's list of New York's 50 Best Webcams. (Are there more than 50? Is there a site that has ALL of them?) 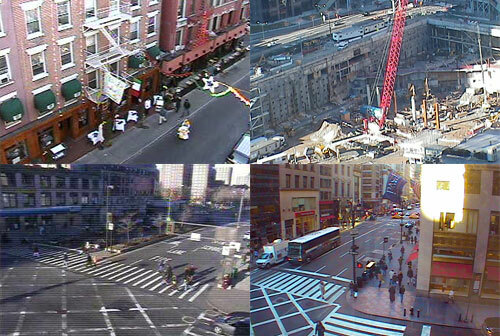 For those of you interested in progress at the WTC site: three webcams will take you downtown, without all the hassle of the financial district. Want to take a jaunt up the Hudson River Park, except from your Powermac G4? Check out the 20 Hudson River Park cams. New York, here I come.